Nextdoor is used by neighborhoods nationwide for community announcements or concerns. The Best of Nextdoor shares what some people actually post, including alerts regarding dog waste on the walking trail, an announcement of calling the sheriff because a “strange truck” drove into a cul-de-sac and turned around, or (my personal favorite) a post from one bored resident looking to start a neighborhood "fight club." Beware, reading through The Best of Nextdoor posts can become addicting, with its Barney Fife meets your nosy Nancy neighbor vibe. While Homeowners Associations usually have a goal of residents helping to keep each other informed, I hardly think this is what they had in mind. Just hearing the phrase Homeowners Association can bring with it a cringe. Residents misusing the communication app or social media is one thing, but having an association dictate how you maintain and manage your own home is another. Visions of red tape, paperwork, and ridiculous regulations to make simple renovations or add on a deck may be the stereotype we’re used to. We’re in America, by golly! No one can tell me what color I’ll paint my trim or how many inches tall my grass can be...can they? If you bought a home in a subdivision, planned community, or condominium complex, chances are good that you were also required to enroll in your neighborhood Homeowners Association (HOA). The purpose of an HOA is to ensure a community functions smoothly, looks its best, and maintains property value. And yes, they can tell you how short you need to cut your grass. The transfer deeds to houses in new developments almost always include limitations on how the property can be used. Usually these limitations -- often called covenants, conditions, and restrictions (CC&Rs) -- put decision-making rights into the hands of the homeowners' association. HOAs usually administer the common areas, neighborhood pool, landscaping, tennis courts, and other amenities. According to Kuester Management group, millions of Americans now live in communities with a Homeowners Association, with the majority of them considering their HOA experience either neutral or positive. HOAs are often run by an elected board of directors made of up fellow community homeowners who oversee and enforce rules. When buying a property, it may come with its purchase a requirement to belong to the HOA, which includes a monthly or annual membership fee. Most HOAs are incorporated and subject to state laws. What can an HOA enforce? It depends. Some HOAs are much more restrictive than others, but common regulations include types and appearance of landscaping, color of paint, siding, shingles on a house, type of fencing, and whether/what type of structural additions are allowed. Some HOAs also dictate which pet breeds are acceptable for the neighborhood and even cosmetic issues like size/type of the street numbers on your home or the look of your mailbox. The goal of all this is to maintain a certain community aesthetic. If you’re accustomed to neighbors parking their vehicles on the lawn or painting the front of their home a garish neon color, you shouldn't have that issue in a community with an HOA. Should I buy a home that’s in an HOA? If you prefer someone else take responsibility for upkeep of common areas and the overall look of your neighborhood, you’ll fit in with an HOA just fine. Architectural and community standards will support your property’s value, which can be a help when it comes time to sell. Some HOAs include trash collection and snow removal in their fees. Rules deterring nuisance activity (noise regulations and pet control would be included in this). Many HOAs offer community events to foster bonds between neighbors. 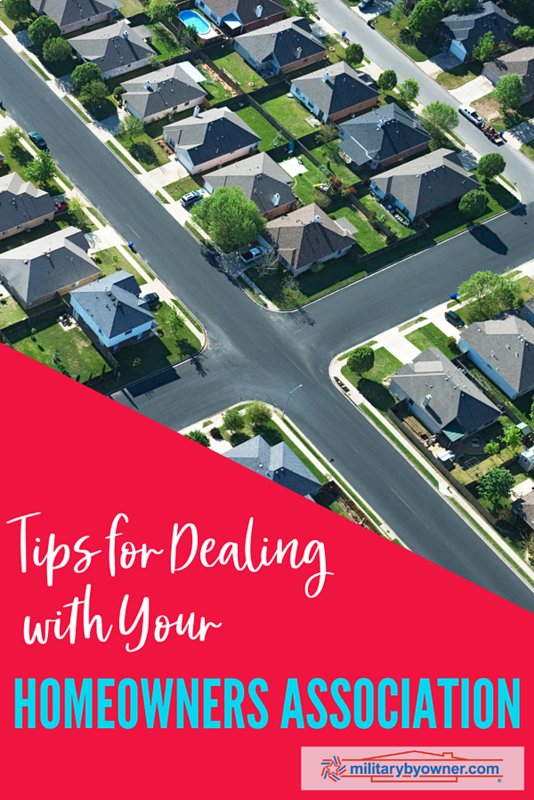 Assistance with resolving neighbor disputes, such as tree limbs encroaching on your property, barking dogs, or lack of maintenance that would affect the value of your property. If you don’t like following rules, an HOA may not be for you. And if you’d prefer to customize your home and don’t want to be required to seek approval for your plans, you also may want to look in a different neighborhood. Strict rules (one homeowner even had her home foreclosed by her HOA after falling behind in paying dues!). Others complain about seemingly arbitrary rules having to do with issues like holiday decorations. Extra fees. Most HOAs allow enough wiggle room in their fees to maintain a reserve fund for repairs and extra expenses. However, some will levy an ‘assessment’ on homeowners if the reserve won’t cover needed repairs or maintenance for big ticket items such as swimming pools or condo elevators. . Conflicts among HOA members. Since a consensus is needed to change governing rules or make decisions about neighborhood upgrades, conflicts can arise. Others cite petty conflicts or even power trips among members or the board. Paying for recreational facilities whether or not you use them. Rental restrictions. Some HOAs have restrictions about how many homes in the building or neighborhood can be rented, which could be a problem if you move and wish to rent rather than sell. Know the HOA rules (and follow them!). Take time to familiarize yourself with your association's Covenants, Conditions, & Restrictions so you're not blindsided by seemingly arbitrary rules, such as how many vehicles you're allowed to have parked in your driveway. Once you've chosen to live in a community with an HOA, you're bound to follow the regulations, so it pays to understand details regarding renovations, pet ownership, and parking guidelines. Remember that communication is key. Give your neighbors the benefit of the doubt and seek to resolve issues on your own first. Being friendly to your neighbors will give you the added benefit of providing an open door for them to talk to you as well if they feel there are problems. A good rule of thumb is to go to your neighbor to discuss problems before taking your complaint to the HOA board. Seek approval for any structural changes. Realize this can extend to even the installation of a satellite dish, so along with being well versed in the rules, knowing to allow time for paperwork and approval of even small additions can help alleviate frustrations. Remember that board members are human. While some communities hire managers to run the HOA, many community boards and managers are made up of fellow residents who may have zero experience in property management. Regardless, communicating concerns in an amicable way is a good first step towards resolving any concerns. Keep in mind that board members will bring their own personalities and experience (or lack thereof) to their positions. Volunteer your own time and resources. Whether you choose to seek election to the board, pitch in to organize community events, or desire to help shape the neighborhood rules and regulations, volunteer! If you don't like a rule, talk to your fellow residents and petition the board as a group to effect changes. For more guidance for both homeowners and board volunteers, see the website Condominum and Homeowner's Association Best Practices. Pay your fees on time. Fees vary by HOA, but for a typical single family home, HOA fees average $200-300 a month, and vary depending on size of home and amenities. Be aware of potential fee increases, which should be outlined in your HOA bylaws. It looks as though Homeowners Associations will be part of the American homeowners' dream for the foreseeable future. And while we hope you won't be publicly calling out your neighbors online like some of the folks on Nextdoor, there are a few things you can do to make the relationship with your HOA as positive as possible. Wondering if a home with an HOA is for you? We've outlined the pros and cons below!